"To get your brand out there, you need to present your business differently than your competition does," he says. "My mentor - Sir Freddie Laker, the owner of Laker Airways - gave me similar advice in Virgin’s early days, and this eventually defined our marketing strategy, helping to make the Virgin brand internationally famous. 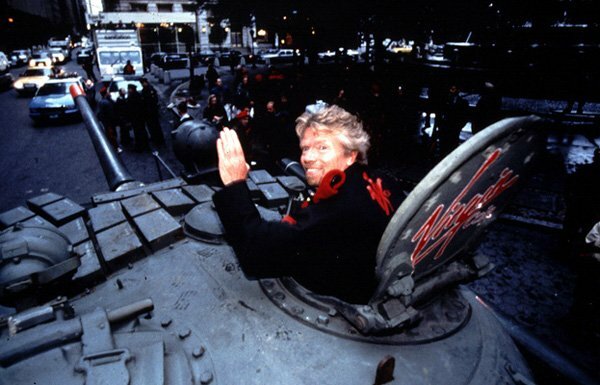 "When we launched Virgin Atlantic, we were entering an industry rife with big players. ‘Make sure you appear on the front page and not the back pages,’ Sir Freddie told me. ‘You are going to have to get out there and sell yourself. Make a fool of yourself — whatever it takes. Otherwise you won’t survive.’"
Over the years, the Virgin Group founder took this advice to heart. Creating various spectacles to draw attention to Virgin Atlantic – including floating an airship with a sign saying “BA can’t get it up” above the London Eye and flew a “UFO” over the capital in the early hours of April Fools’ Day. "Over more than 40 years, the Virgin team has launched hundreds of companies worldwide, and I’ve done some outrageously fun and entertaining things in the name of marketing our products and services," he says. "I donned a wedding dress to launch Virgin Brides; drove a tank down Fifth Avenue in New York to launch Virgin Cola; jumped off the roof of the Palms Hotel and Casino to celebrate the first Virgin America flight to Las Vegas; maneuverered an amphibious car across the English Channel to mark Virgin Atlantic’s 20th anniversary; and drank champagne while rappelling down the side of a new Spaceport air hanger for Virgin Galactic." Virgin aren’t the only ones to have used inventive marketing to get themselves noticed though. As Richard notes, U2 put their album in the spotlight by giving free copies to everyone with an iTunes account, Samsung was behind Ellen Degeneres’ famous selfie at the Oscars, Taco Bell outraged and entertained by placing an ad in The New York Times proclaiming "Taco Bell buys the Liberty Bell", and Burger King released the "Left-Handed Whopper". "Ask yourself: Why did you start your business? What is it that sets your products and services apart from the rest? What would you ultimately like to achieve? "Once you have that down on paper, brainstorm some fun and entertaining ways you can deliver your message. And don’t shy away from asking for help. You said you were born into a business-minded family - ask for their ideas and opinions. "If you run into naysayers, remind them that no matter how great your product or service is, no one will hear about it if you don’t attract attention - it’s that simple. So do something original. Do something your competitors have never thought of. "Above all, remember that inventive marketing - and creativity in other areas of the business - is not just rewarding, but a lot of fun."